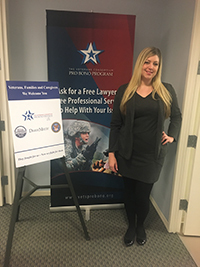 Samantha Stiltner, TVC Staff Attorney, conducted a training for Law Students at The Catholic University of America Veterans Advocacy Clinic on 20 January 2018. 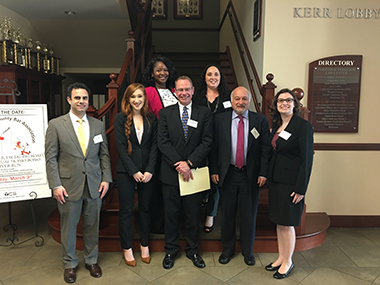 The training provides students an overview of the processes and the law involved from filing the initial claim through appellate advocacy at The Court of Appeals for Veterans Claims. We look forward to seeing you in the coming year. Time: 2 pm. to 4 p.m.
For more information about our nationwide TVC Discharge Upgrade ProgramSM, contact Danica Gonzalves at upgrades@vetsprobono.org. For any questions or more information, please email Danica Gonzalves at upgrades@vetsprobono.org. More than 60 attorneys attended TVC's training on Pro Bono Representation before the U.S. Court of Appeals for Veterans Claims in Tampa, Florida on 9 February 2018. Quarles & Brady LLP and the Hillsborough County Bar Association generously hosted the training and reception. Current local members of our National Volunteers Corps attended the reception to network with the new group of volunteers. "It was a great opportunity to thank them personally for their service to our nations defenders," said Courtney Smith, Director of Volunteer Outreach & Education. "As a TVC staff member, it's important for us to be able to spend time with our pro bono attorneys and these receptions are an ideal way to make that personal connection." The attorneys are now ready to represent our nation's heroes at the U.S. Court of Appeals for Veterans Claims. Please join us in welcoming our 61 newest members of the TVC National Volunteer Corps! Instructor Team, left to right. Front row: Rick Spataro; Tara Petzoldt; Judge Michael Allen, U.S. Court of Appeals for Veterans Claims; Bart Stichman and Jill Davenport. Back row: Courtney Smith and Colleen Miller. The Veterans Consortium was proud to join more than 70 community organizations on Saturday, 27 January 2018, to participate in the 24th annual Winterhaven Homeless Veterans Stand Down at the Washington DC VA Medical Center. Winterhaven is a full day of services dedicated to supporting veterans who are homeless, underemployed or at-risk of homelessness in the District of Columbia, Maryland and Virginia. The TVC team was joined by Neighborhood Legal Services Program, and members of our National Volunteer Corps from Duane Morris, to support this annual event. We met and performed "legal triage" for more than 300 veterans and assisted 33 veterans that had an immediate need for legal support. Other veterans, who did not have pressing legal needs, received information and referrals to our Veterans Pro Bono Legal Clinic that occurs every Friday in partnership with the Transition and Care Management Office at the DC VA Medical Center. "Winterhaven is a wonderful example of how our community can work together to meet the needs of our service men and women, said Samantha Stiltner, Program Manager of the Veterans Pro Bono Legal Clinic. "It was a privilege to be there and to help provide legal assistance to our veterans." 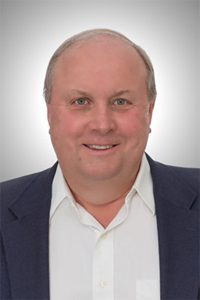 As an analyst and litigator of first and third party coverage disputes with policyholders, W. Douglas Berry's law practice centers on extra-contractual claims, appellate advocacy, municipal liability and reinsurance coverage. He also serves as general counsel for his Tampa-based firm, Butler Weihmuller Katz Craig, LLP, after 14 years as managing partner. Yet somehow, Berry has found the time, since 1994, to represent veterans as part of The Veterans Consortium's national volunteer corps. His 20 years as a U.S. Marine must have taught him the precision to juggle so many tasks. In honor of his legal service to veterans, Berry, 70, has been chosen as The Veterans Consortium Volunteer Inspiring Pro Bono for February 2018. He says he's "honored but undeserving." But that's not what the half dozen or so veterans he's served would say. He's worked tirelessly to represent them, though he's never met one of them in person. There have been no court appearances. "I do it all from my desk in Tampa," says Berry, a Pennsylvania native who moved to nearby St. Petersburg Beach, FL (now known as St. Pete Beach) when he was five years old. In addition to the pro bono work, any attorney fees he or colleagues from his firm earn from these cases under the Equal Access to Justice Act are donated back to TVC to help more veterans. His firm has made separate donations, as well. That translates to nearly $55,000 since 2003 for TVC's mission. 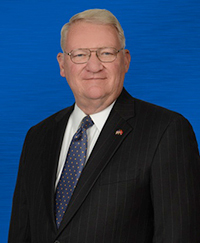 Berry got his start with TVC after his good friend, now a Senior Judge of the U.S. Court of Appeals for Veterans Claims, Lawrence Hagel, helped create the structure and became a founding executive board member of TVC. Berry and Hagel have a long history dating back to being classmates at the U.S. Naval Academy. They went through U.S. Marine Corps basic training together in Quantico, Va., served in Vietnam at the same time and both spent their final tours in the Office of the Judge Advocate General of the Navy in Alexandria, Va. "The door was opened and I was either pulled through or pushed through by Judge Hagel," Berry jokes of his start with TVC. Either way, it was a natural next step for Berry to join Hagel in yet another venture. "What an honor it is to have such a strong legacy as part of TVC's National Volunteer Corps," said Courtney Smith, TVC's Director of Volunteer Outreach & Education. "Doug's investment of his time, knowledge, and skills to helping our nation's Veterans has been invaluable." Jim Carlsen's work as a pro bono attorney for appellate cases as part of The Veterans Consortium National Volunteer Corps led him to want to do more with the organization. His extensive legal background as a U.S. Marine, with a large law firm and as senior counsel with major corporations made him a perfect candidate to join TVC as a volunteer senior fellow after his retirement. His work in that position led to his being tapped as Director of Program Operations last July. Carlsen jokes that he was "failing retirement" when he agreed to take on this position. But it was really his brother-in-law who connected Carlsen with the heart of the TVC mission. Suffering from the effects of Agent Orange and in hospice care, this former Army Colonel and a lawyer, himself, asked Carlsen to represent him in a case before a Veterans Administration regional office to get the benefits he deserved. Carlsen found the bureaucracy "maddening and incomprehensible." Carlsen got the benefits for him before he died, but it made Carlsen think about other veterans, who didn't have similar resources. 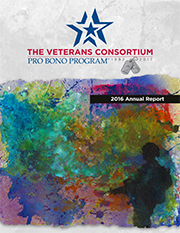 At TVC, Carlsen has complemented his CAVC Federal Pro Bono Program work with a focus on TVC's Discharge Upgrade ProgramSM, which serves veterans with Other Than Honorable military discharges due to Post Traumatic Stress Disorder (PTSD) or Traumatic Brain Injury (TBI). The program has expanded over the past year with the addition of an Equal Justice Works Fellow and is on track to serve some 800 to 1,000 veterans this year. In addition, Carlsen has used his Lean Six Sigma experience to co-lead a process improvement group to help make TVC even more efficient. Carlsen lives in Pasadena, Maryland, where he enjoys boating, studying Milton and spending time with his two grown children. As a certified welder, he builds theatrical sets for high school students that his daughter teaches.